The fiery trio of temptresses with twang, Pistol Annies, are BACK and they’re making one hell of an entrance with the sassy southern song “Got My Name Changed Back”. Take a look at the official video below and let us know what you think! 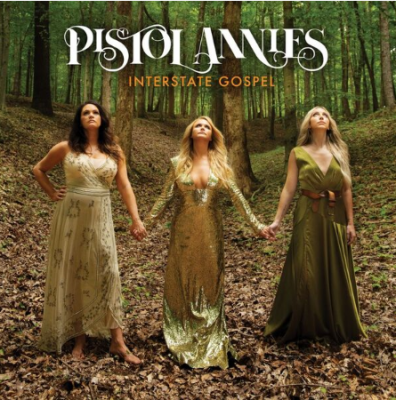 Country supertrio PISTOL ANNIES have released the official video for their single “Got My Name Changed Back” off their anxiously-awaited third album INTERSTATE GOSPEL, releasing this Friday Nov. 2 on RCA Records Nashville. Watch the video HERE. Listen to the song on all streaming platforms and pre-order the album HERE. Following last week’s sold-out show at Nashville’s historic Ryman Auditorium, the trio will perform at NYC’s intimate venue The Town Hall this Friday, Nov. 2 and LA’s breakout downtown concert hall The Novo on Nov. 7. These shows are the Annies’ way of inviting their fans into their living room to hang, talk, laugh and commiserate about real life while singing their own kind of country music. Fans who pre-order the album at any digital retailer will instantly receive “Got My Name Changed Back,” as well as previously-released songs including the “classic country tearjerker” (Stereogum) “Masterpiece”; “sly take on gender roles” (Variety) “Sugar Daddy”; “saucy, high-spirited” (Rolling Stone) “Stop Drop and Roll One“; “more irreverent than earnest” (NPR) “Interstate Gospel”; and “confession of dead-end desperation” (New York Times) “Best Years of My Life.” All five records are also available on all streaming platforms. Find the most current Pistol Annies tour dates from our partners at Country Music On Tour, your trusted country concert ticket source! Country Music News Blog participates in advertising programs that help fund the operation of this site. For more information please visit our privacy statement. This entry was posted in New Music, Pistol Annies, Press Releases by Shauna "WhiskeyChick" Castorena. Bookmark the permalink.